Zoho Calendar's flexible layout and myriad of features ensure you stay on top of your schedule. Create events, invite users, manage group calendars, and share and subscribe to calendars, all from a single interface. Create events in your calendar using a few simple phrases. Track invitees' responses using periodic updates, and remind your guests about an event at the right time. Set up multiple calendars to keep your personal events separate from your business schedule. Make your calendar public so coworkers know what you're up to, or share a private URL with a select few. Communicate effectively through your calendar by embedding it on your website; include when you're free or busy, or showcase event details. Set up a group calendar to keep teams in sync. Plan a project review meeting, a sales report overview, or another high-profile meeting with confidence by getting group members to respond about their availability. Schedule appointments without all the back-and-forth. With your calendar embedded on your website, anyone who wants to meet with you can request an appointment in one click. Easily migrate your other calendars into Zoho Calendar. You can also subscribe to several calendars, like your region's specific holiday calendar or other public calendars. There's more than one way to sync your Zoho Calendar from the web to your desktop and mobile devices. Choose between CalDAV, Exchange ActiveSync, or Zoho CalSync. 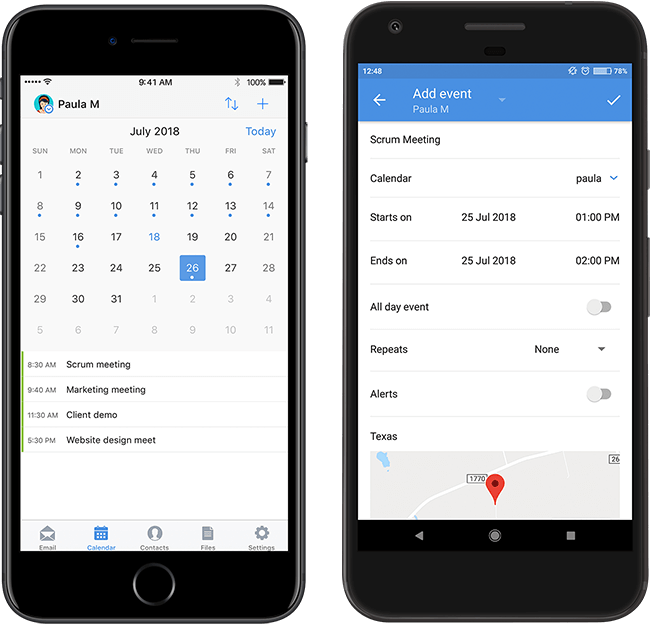 Access Zoho Calendar on your mobile device using the Zoho Mail app or switch over to the mobile version of the website.